Executive Summary. This report is an analysis of the strategic choice made by the Coca-Cola Company. Porter’s four generic strategies are the model used to individuate and describe the choices made by the Coca-Cola Company. 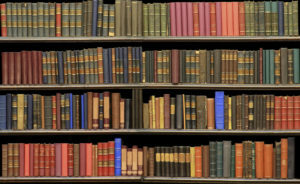 The report gives the indications of which strategies are used and which are not, plus, it describes how it is possible to have this knowledge. The second step in the report is to analyze the alignment of this strategy with the firm strategies individuated via a SWOT analysis, provided briefly in a graph in the Appendix. The company is well aligned in terms of strengths and opportunities, while there are some disconnections in terms of weaknesses and threats. The report deals with those disconnections providing some possible changes both in the strategy for the weaknesses, focusing in particular on the health issue, and for the threats, looking in depth at the climate change and water scarcity problem, with the objective of turning these weak spots in strong spots for the company. Lastly, the report reviews the mission, vision and value statements of the company. Mission and vision remain the same, while the value statement is slightly modified in order to express in better terms the necessity to address the issue of sustainability, plus there is a proposal of adding video content in order to achieve a better communication with the customer base. Introduction. This report is an analysis of the strategic choice of the Coca-Cola Company. As one of the biggest corporation on the planet (Coca-Cola, 2018), the importance of the strategy adopted is fundamental in order to aspire to maintain this status worldwide. The report is going to focus firstly on the implementation by Coca-Cola of Porter’s four generic strategies, if they are all implemented or not, and how it is possible to recognize the different strategies. Then, the report will move on talking about the alignment of those strategies with the strengths, weaknesses, opportunities and threats of the company. The paper will also talk about some suggestions of different strategies that are more adherent with the strengths and opportunities of the company, taking into consideration how to face the internal weaknesses of the company and the threats posed by the external environment. Lastly, a review of mission, vision, value statement and goals, and objective will be performed, in order to adjust them with the analysis of the report. The conclusion will synthesize all the contents of the report. 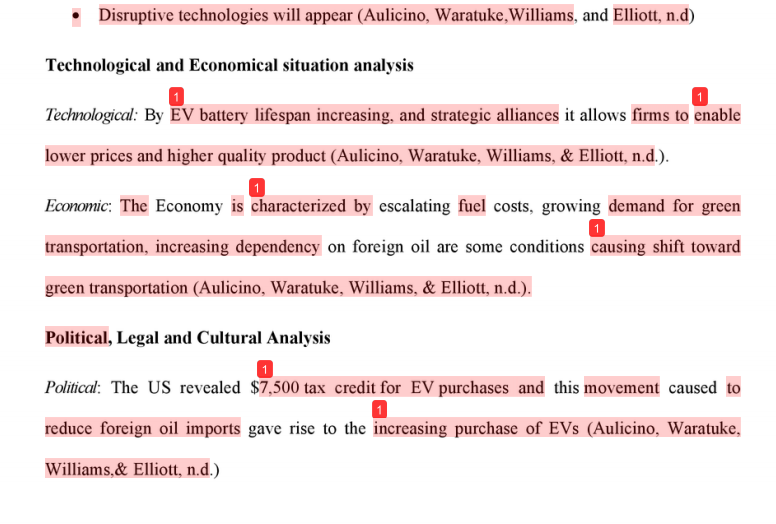 For this analysis I’ve used different sources, tough I based my evidence on Coca-Cola’s website and Annual Report. Where needed, I use also credible websites and documents to support my evidences. Porter’s four generic strategies. The Porter’s four generic strategies are four ways in which a company could achieve a long success throughout the years. The first two, cost leader strategy, and differentiation strategy, are developed with a broad target in mind, the other two are developed with a narrow target in mind, and they are called focus strategies (Porter, 1985). The Cost Leadership Strategy is about cost, of course. The market will respond positively to a product with a cheap price that could be sold to many potential customers, winning the market in the process (Kossowski, 2007). The Differentiation Strategy, in contrast with the cost strategies, revolves around the creation of a perceived difference between the product and the competitors. The difference is what makes the company successful on the market (McIvor, 2005). The Focus strategies adopt a narrow focus, where the company should focus on a specific target market (niche strategy). Once the niche strategy is applied, it is possible to implement the Cost or the Differentiation strategy to the chosen niche market (Kossowski, 2007). To determine the company’s strategy, is relatively easy. The Coca-Cola Company focuses on a broad target; it is possible that some sub-brands could use the same type of strategy, but the company as a whole does not need it. As for the cost strategy, the company does not need to use it, as it has already achieved a low price, tough it has certainly been used in the past, when it was necessary to achieve market primate by reducing the cost of the products (Stewart et al., 1995). The company definitely used and still uses the differentiation strategy, as the marketing campaign had and still has, as main focus, the identification of the brand as a source of happiness and fulfillment. This differentiation strategy has proved over the times to be the most successful one, as to this day the Coca-Cola Company has a top position in the sector of soft drinks and beverages (Stewart et al., 1995). Alignment of the strategic choices with the firm’s generic strategy. As it is possible to observe just by looking at the SWOT graph (Appendix 1), the major integration between the strategic choices and the SWOT is the brand strategy. That represents the main strategic choice and it also represents one of the biggest strengths of the company. The other strengths of the company are both the results of past strategies, like the main presence in the market, and a diverse prospective on the differentiation strategy, like the majorly diversified portfolio. The opportunities of the external environment are also represented in this strategy, as manifestation of the past and present strategies as well: the new growth market represents chances to furtherly diversify the portfolio, and the lack of real competitors is a direct result of the past strategies (Johnson & Peppas, 2003). Looking at the weaknesses and threats, it is possible to find some points of disconnection between the firm’s general strategy and the Porter’s four strategies. The strategy used, a differentiation one, while it address the positive emotions associated with the brand, it does not take into consideration all the negative aspects including: the health concern and the bad publicity derived from it, and surely it does not address the threats posed by water scarcity and climate change. While this is understandable, as perhaps the company does not want to be associated with those negative aspects, this is still an element of disconnection between the firm’s strategy and Porter’s differentiation strategy (Johnson & Peppas, 2003). Different strategic choice. Different strategic choice is always a possibility. In this report I have included one that is possible to split in two parts, one facing the weaknesses, and one facing the threats, while the objective remains the same. The aim of the strategy is to address its weaknesses and threats, turning them into strengths and opportunities (Ansoff, 1980). As for the weaknesses, there are a few ways to address health concern: while someone could propose to finance some studies to prove that the soft drinks are not an issue for the health, as it was done by the tobacco industry (Myers, 1995) and by the energy industry (Hoggan, 2009), I do not think this is a valid strategy to adopt, both in terms of how the public could react if they found out about it, and also because I consider this an unethical practice. One way to make a real difference in addressing the health issues is to funds researches that could find different ingredients to makes the same beverage but with less impact on the health. Then, of course it is possible to publicize them and turn what was a problem into a big strength for the company. As for the threats, while new regulations and industry rivalry are very real possibilities, they also are a stable in the life of the company, so the Coca-Cola Company knows already how to face those (Coca Cola, 2018). On the contrary, dealing with climate change and water scarcity is a new threat that must be addressed yet, I do not think it is possible for the company to use their opportunities to do so. The company needs to plan a climate strategy that addresses the problem at the base: the CO2 concentration on one side, and the use of natural resources on the other side (Hoggan, 2009). 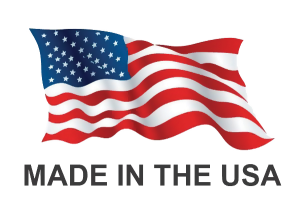 This could be done by making some substantial investments in the way the company produces its goods: by reducing the use of natural sources, and by making a production line that is more circular than linear, the company could achieve som­­e fundamental objectives (Sachs, 2015). After that, the company should also become part of the conversation about climate change and help both customers and other companies to follow its lead in dealing with one of the greatest threats for our civilization. Company’s Mission, Vision and Values statement review. After this review of the strategic choices, I consider the Mission and the Vision statements of the company still valuable the way they are now, so I would not suggest any changes, considering also that in the vision statement there is a reference to the necessity of building sustainable communities (Coca-Cola, 2018). There are a few changes I would make to the value statement and the global objectives of the company. These changes should reflect the will of the company to address the important aspects of health issue and climate change as a part of their strategy. As for the value statement, I would add a value that reflects the importance of tackling the climate change issue, like sustainability, for example. Moreover, besides the changes I suggested before, I would also take into consideration the possibility to communicate mission, vision and value statements into brief videos to share. The video gives immediacy to the content, and also represents a huge opportunity to make customers aware of the reality of the company’s statements through an exclusive point of view, giving the company a resonating momentum that could last several years (Kolb, 2016). Conclusion. 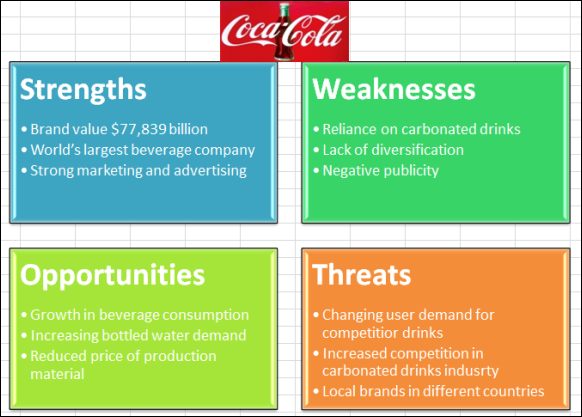 The objective of this report was to analyze the strategic choices of the Coca-Cola Company. First of all, the report begins with a definition of Porter’s four generic strategies, and then it continues with the application or non-application of those to the company. The analysis shows that the company applies the differentiation strategy on different levels, both diversifying the portfolio and focusing on the brand strategy to promote the association between the beverages and positive emotions. Second, the report analyzes the alignment of the strategic choices with the firm’s generic strategy, looking at the SWOT graph. The strengths and the opportunities were well aligned with the strategy, while the weaknesses and the threats were not. The report goes on with a few possible changes to make the strategy more inclusive, primarily transforming weaknesses and threats into strengths and opportunities through some investments. Lastly, a review of mission, vision and value statements was performed: mission and vision remained the same, while a value was added to the value statements (sustainability) and I proposed to present those contents in a video to show their reality to the customers, to appeal to new generations, and also to show that the loyalty the public has always demonstrated to the brand is not mistrusted.